About 25 miles east of Denver’s urban core, across acres and acres of sprawl and rural fields, Mayor Michael Hancock delivered his annual “State of the City” address at Denver International Airport today. Hancock acknowledged that many residents aren’t reaping the benefits of Denver’s economic growth. Nodding to the city’s homelessness epidemic and housing shortage, he announced the Office of HOPE — Housing and Opportunities for People Everywhere — before turning his attention to transportation. It’s always helpful to hear how the mayor is framing his transportation agenda, even if most of what he said was warmed over talking points. But if you were hoping Hancock would suddenly embrace the urgency of re-orienting Denver streets around walking, biking, and transit as the city rapidly grows, today’s speech was sorely disappointing. The mayor spent more time trying to convince people that widening I-70 is a big win for the climate and public health than he did outlining a vision for safe streets and convenient local transit. 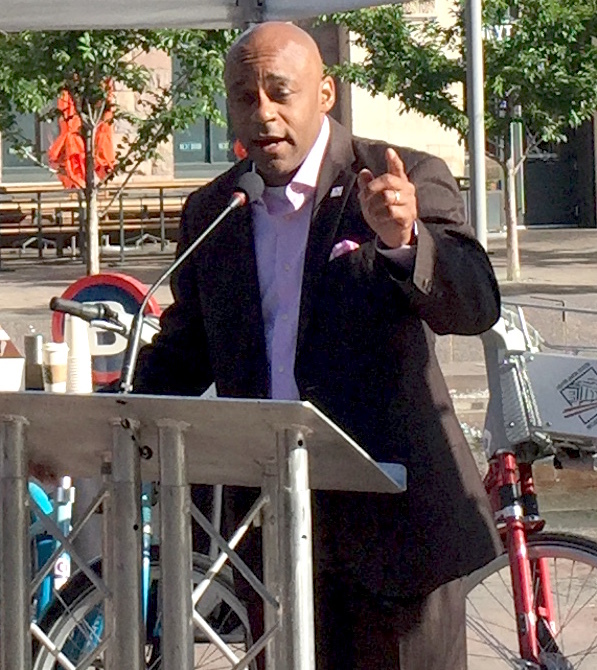 While mobility freedom is Denver’s future, we must also address barriers of the past. I-70 has cut Globeville, Elyria and Swansea in half for decades. Denver has been at the table with CDOT for 13 years to improve this stretch of I-70 and to represent residents, businesses and adjacent neighborhoods. We have gotten CDOT to agree to unprecedented steps to mitigate climate and health impacts, to improve Swansea Elementary School, to knit these neighborhoods back together. And we offer our congratulations to CDOT for winning a federal grant to train local residents for the local jobs that this project will create. No less an authority than Transportation Secretary Anthony Foxx has spoken out against the damage that freeway construction caused in disadvantaged urban neighborhoods in the second half of the 20th century. If Hancock really wanted to address “barriers of the past,” he would do everything in his power to stop CDOT from gouging a wider I-70 through north Denver. Instead, Hancock provided cover for Governor John Hickenlooper and CDOT, echoing the line that more lanes of traffic will be some kind of community development project. When Hancock says the project will “knit neighborhoods back together,” he’s talking about a four-acre park atop a 10-lane sunken highway — a tiny portion of the 10-mile-long I-70 widening. The bit about striving to mitigate “climate and health impacts?” The Sierra Club and local advocates disagree, which is why they’re suing to stop the project. A revamped Swansea Elementary School? Housing advocates say that many families living there now won’t benefit because they’ll be uprooted by highway construction. Let me tell you, I am so proud of the work done by our Smart City Challenge team. Even though we were not selected by the U.S. Department of Transportation for grant funding, we have a solid plan moving forward. We will be unrelenting in our pursuit of other funding opportunities and in making this a priority in the city’s 2017 budget and beyond. Over the coming year, you will see new projects that will make Denver more walkable and bikeable. Projects that will reduce congestion and improve safety through our commitment to Vision Zero. This means deploying new technologies to not only improve traffic flow, but to break down digital divides. It means converting public and private vehicle fleets to electric cars and trucks, and installing new charging stations around town. It means installing new B-Cycle stations and encouraging more car and ride sharing. And it means expanding the Go Denver app into a one-stop mobility marketplace where you can shop and pay for any transportation service, including RTD bus and rail, on your smartphone or with a smart card. The fact is that Hancock has failed to secure dedicated funding for sidewalks or bike lanes, forcing Public Works and active transportation advocates to scrap for money every year to build out basic infrastructure for walking and biking. Will the mayor ever give time-tested solutions like safe street design the same due as car tech? Like affordable housing, accessible mobility choices can help each and every one of us live better, easier lives. Camille Lewis knows this well. Camille is a single mom of two boys, she found new affordable housing at 40th Ave. and Colorado Blvd. The housing is great, but just as good, she has easy access to the new University of Colorado A Line train that takes her to work. This train does not just provide a new connection between downtown and this beautiful international airport, it connects people to housing, jobs and education. Hancock’s right — good transit access makes life better, the A-Line seems to work well for Camille, and trains should definitely connect people to their everyday needs. But is Denver building that kind of transit? It’s a big stretch to say a commuter rail line between downtown and the airport, as important as it may be, is a great example of what transit should be doing for the city. Transit stations should anchor walkable and bikeable neighborhoods with high-frequency service. But the neighborhoods around the stops between Union Station and DIA are not very walkable, according to Hancock’s own administration, nor are they dense centers of housing or jobs. Most stations are surrounded by parking lots, subsidized by riders who pay higher fares so drivers can park for free or on the cheap. I hope many of you took the train here this morning. RTD is delivering on its biggest year yet of FasTracks, opening four new rail lines in 2016. By the end of the year, Denver Union Station will see 100,000 commuters passing through its turnstiles every single day. Rail is just one mobility option now serving our region. Uber and Lyft offer carpool options, B-Cycle has added more stations, and in February we launched the Go Denver smartphone app to put the fastest, cheapest and greenest options right at your fingertips. The goal is mobility freedom, providing everyone with safe, reliable, sustainable and affordable options to get around town. Slick, comforting words. But Hancock didn’t mention what Denver really needs to complement its growing regional rail system — a network of fast, frequent intra-city transit service. Other than a glancing reference to Denveright (“an unprecedented effort to coordinate four citywide plans that will chart the course of the Mile High City for the next 20 years”), Hancock gave no indication that improving the city’s local transit network is a priority for him. Putting a rosy spin on a neighborhood-choking highway expansion without saying a word about better bus service? That about sums up the Hancock transportation agenda. Ah yes, the classic “They aren’t doing it my way so it must be corruption” line of reasoning. Pretty well versed in it, actually. Just sick an tired of people automatically jumping to the corruption angle. You have zero proof, you just automatically called it corruption. The beauty of corruption is, it’s never know till long after. Yep, zero historical proof of corruption in denver. The place is practically a haven for ethics. Can I sell you some land for the airport? What has been the population growth and automobile registration in the Denver area since the original I-70 there was built a half century ago?